This highly decorative fern bears two types of fronds that rise above the leaves. 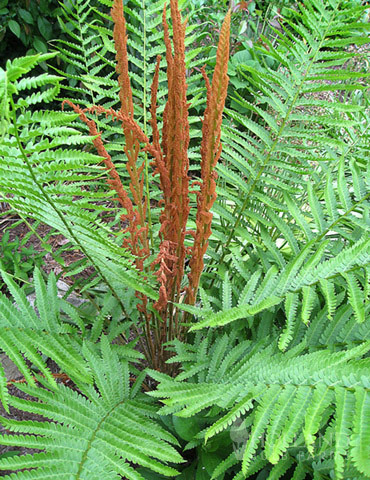 The fertile fronds that contain the spores look like Cinnamon Sticks (hence the name Cinnamon Fern) while the sterile fronds which are not as decorative are yellowish green. This fern prefers moist soil, in a part shade to shade location. This fern is often called a living fossil as records date it back 75 million years ago! very pleased. Had sprouts on them already.